A well-ventilated general purpose helmet with integral back light, the Carrera Luna is a medium-weight lid that will take you from trails to streets and the visor will keep off the winter rain. Not available in pink (thankfully). Retailing at £49.99 but available for up to £15 cheaper if you shop around, this is a good value helmet. Its stand out feature is the surprisingly effective integral back light which can be operated with relative ease on the move, even in gloves. 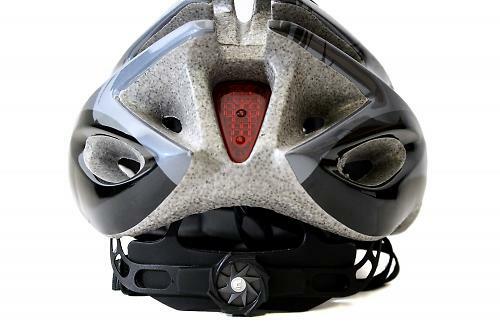 The red LED light is set into the helmet, so can only be seen from directly behind your head and its recessed position protects it from the weather – a must as the light unit itself isn't waterproof. The light unit can be removed for battery changes or permanently to give a 25th vent. The helmet has 24 vents, which Carrera claims to be the highest in its class and the internal channels work to circulate hot air effectively away from your scalp. Testing this helmet mostly in the rain, I got wet in 24 different places but overheating certainly wasn't a problem at city commuting speeds. The lining is removable and washable, and the soft padding is covered with a sweat-absorbing mesh which adds to the helmet's cool-factor. There is an insect net integrated into the padding but no passing bugs chose to test this feature out. At 280g including the back light (around 15g), the Luna is a similar weight to others in its price range. It's available in two sizes – S/M 54-57cm, and L 58-62cm. Size adjustments are made via a dial in smooth 2mm increments, so it's easy to get an accurate fit. The adjustment system is set quite low on the neck so while it's easy to adjust on the move, I found the rubber coated dial tended to catch my jacket. The chin straps were easy to click and adjust but there was no padding so the plastic clip sat directly against my chin. Despite being labelled as a small/medium, the helmet we received to test was a little too big for my 56cm head, even on the smallest setting, and measuring the internal diameter showed that this was indeed the larger size despite all the labelling being to the contrary. This meant that it did fit some of the chaps in the road.cc office, and they weren't even particularly put off by the supposedly feminine design. The ladies' version of the Carrera Hillborne, the Luna swaps the men's paint splattered effect for a subtle swirly leaf design which, in grey on black hardly screams 'women's wear'. The other colour scheme available is gloss white and turquoise which strikes a much more girly note, but still, thankfully, isn't pink. 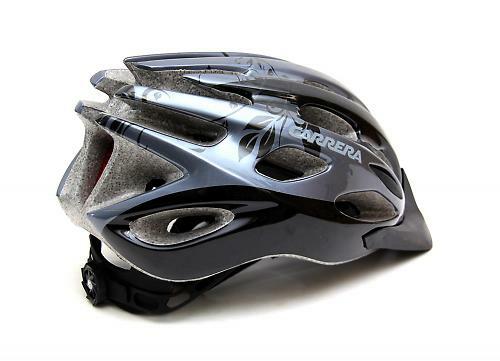 The shape is the same as the men's equivalent helmet and has a sporty feel. Apart from the swirly styling, I couldn't find any aspect of this helmet which made it female-specific. It didn't fit around a ponytail and the sizing was equivalent to the men's helmets – I would expect a ladies' model to fit smaller than 54cm as its minimum. If you hate the idea of a visor, then there is a pure road equivalent in the Carrera Pistard road helmet which is exactly the same model, sans visor. Personally I like to keep the rain off my specs so I found it a useful feature. The visor extends nearly 4cm from the edge of the helmet, and the angle means that visibility can be impaired if you have your head down. A removable visor would have been a sensible move for Carrera, instead of producing two discrete models. Having an integrated light really made this helmet for me, with such a minimal weight gain from the LED it was a great way to increase my visibility without any effort. A good helmet for a good price, in the right size I couldn't ask for much more for my money. Well-ventilated and well-priced with a visor and integrated rear light that make it thoroughly practical. It is marketed as an MTB helmet due to the non-removable visor but the weight, light and vents mean it does perfectly well as a road lid too. The EPS is well covered. 280g including the light and visor, 260g without. Wrong size labelling aside, the padding, ventilation and back adjustment made the helmet comfortable to wear. Chin padding would have been appreciated. 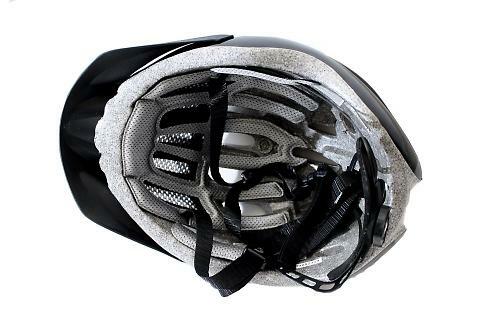 Even at the RRP of £50 the helmet is better ventilated than most others at this price, and the integral light saves money on buying one to put on clothing or a backpack. I didn't fall off so can't comment, but it meets the European safety standard EN 1078. The wrong size labelling. That's pretty unforgivable. How can this possibly be "a lady's helmet"? It is neither pink and nor is it 'baby blue'. But it does have foliage of some description on it, so it definitely qualifies.